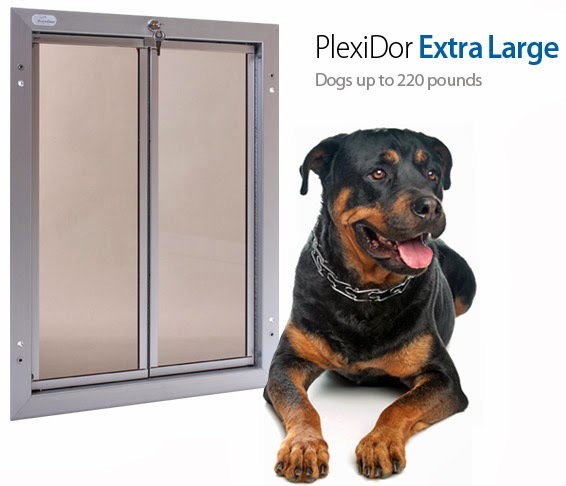 Plexidor Pet Doors: Can I put a PlexiDor through the wall? Can I put a PlexiDor through the wall? PlexiDor with aluminum wall tunnel. 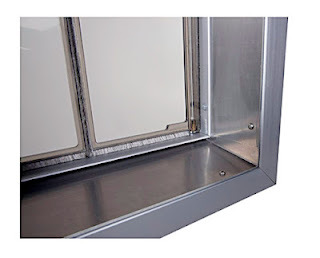 Many who install a dog door or cat door puts it in the human door. This is usually the easiest way to install a pet door, but it's not always suitable. Making a hole in a wall can be more intimidating than making a hole in a door, but it looks really nice when the project is finished. PlexiDor has wall kits that can be used for stud, brick, block, or cement walls. 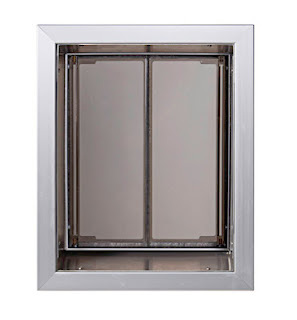 The wall kit comes with an aluminum tunnel that connects the interior and exterior frames. The phrase "aluminum tunnel" might not make sense immediately. If you didn't have the tunnel, you'd see the inside of the wall here. Depending on the construction of your house and where you put the door, that can be bricks, wood, insulation, or even empty space into the wall. 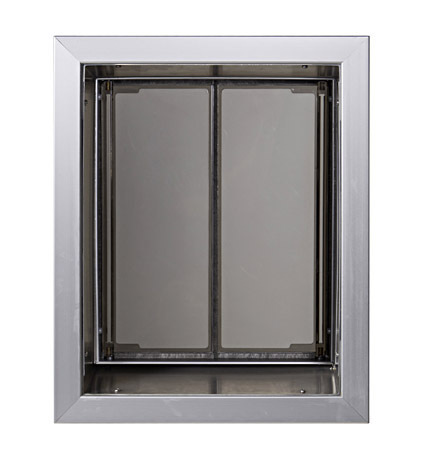 The tunnel covers the edges safely, and gives a professional appearance. The bottom tunnel section is sloped to prevent water from entering. The tunnel won't rust, has no sharp edges, and is easy to keep clean. When you see photos of the PlexiDor, the side with the lock and key goes on the inside of the house. It's easy to think that it's outside, but you don't want to go outside to lock the door. inside of a door or a wall. 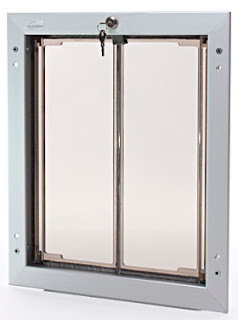 There are wall kits available for all size PlexiDors, from the smallest to the electronic. 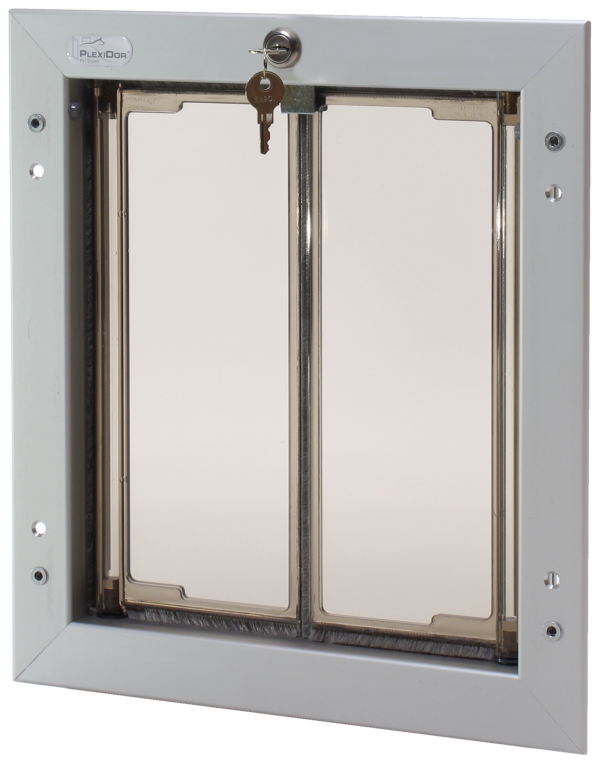 The doors presented on this page all have the silver frame, but they are also available in a durable, baked-on white or bronze finish. Many worry about safety. The PlexiDor comes with lock and key, and there's a steel security plate that attaches to the frame. There is also an awning available to protect from sun, rain, and snow. 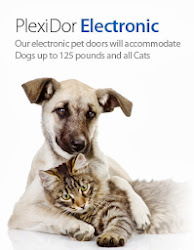 Win 1,000 lbs of dog food! What does that meow mean? Make some healthy dog biscuits!